In June of this year Austria and Switzerland will host the European Soccer Championship 2008, and preparations are underway for this major sporting event welcoming Europe’s best soccer players and most loyal fans. The Euro 2008 expects 550,000 visitors in the stadiums, up to 2 million participants in fan miles and public viewing and 8-10 billion viewers on TV. For three weeks, beginning with June 7, the ball will be kicked between Austria and Switzerland before the final whistle signals the end of the European Soccer Championship on June 29 in Vienna’s Ernst-Happel Stadium. Austria will host 16 out of 31 matches. 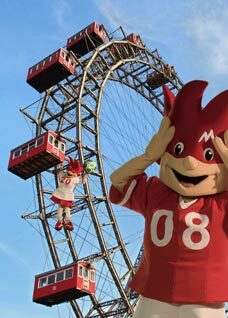 The Ernst-Happel Stadium in the Vienna Prater, which accommodates up to 50,000 fans, will host 7 matches; Salzburg, Innsbruck and Klagenfurt will host 3 group matches each.